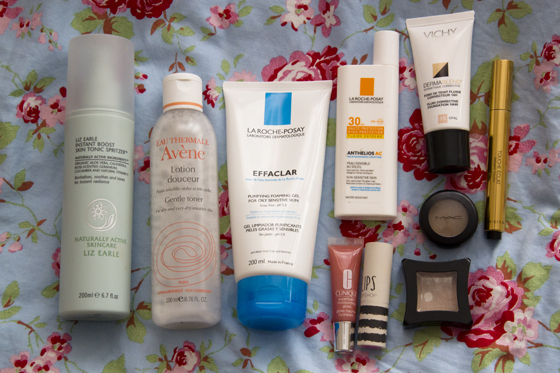 It's the beginning of July, so it's time for June favourites. These type of post are my favourite, I also love watching monthly favourite videos on youtube. You can always find new things for yourself. Here are my favourites. I always add a link to the product which had full review, and those one that don't have any links, then the review it's on it's way. Liz Earle Skin Boost Tonic Spritzer: Such a great tonic, I love to spray my face with it before actually applying foundation, just to have slightly wet base. I also spray it on my face before applying night cream on. I love spraying things on my face. Avene Gentle Toner: I recently had added this to my wants list and I finally got it. Such a great toner, it's so gentle on my skin. I'm half way through it already. I use it twice a day, and sometimes to refresh my skin during the day, when I'm not wearing make-up. La Roche Posay Effaclar Foaming Face Wash: I recently had posted a full review on this. This is my all time favourite face wash gel. It's helped me as lot with my break out, which went out of control. 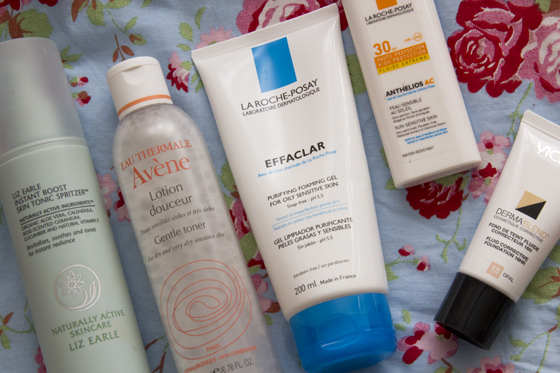 La Roche Posay SPF 30 Anthelios AC: Sun protection is a must for me! I need to get SPF 50, as I always get sunburn. I love this on my face, as it's really light and doesn't make my skin oily, but on the sad note I think that this is clogging my pores. Vichy Dermablend Foundation: Such a fab foundation when I have tan on. I have the lightest shade, but is still pretty dark, so I have to be a little tan to wear it. The coverage is pretty medium to full. It's really lightweight, I would say it's very similar to Estee Lauder Double Wear but leaves much more nicer feeling on the face. The ingredients are really friendly to our skin. YSL Touche Eclat Illuminating Concealer: As I been recently have been sleeping really well I don't need to use much coverage on my eyes, this is such a fab illuminating concealer. MAC Omega Eyeshadow: This is the most used products, I been using it every day for around 1,5 month, the best colour for my eyebrows. It's really nice to use on the crease. I'm planning to do a full review, with my actual eyebrow routine. Illamasqua Eyeshadow in Slink: The first eyeshadow I had ever hit pan on! I use it on daily basic, such a pretty Champagne colour. It brightens my eyes a lot. Topshop Lipstick in Tease: My new obsession, such a pretty bright purple pinky colour. I love this on my lips, I normally don't go mad with my eye make-up. So I go a bit crazy with lip colours. Clinique Superbalm Lipgloss in Apricot 01: I always carry this around with me, as my lips started to get pretty dry and I don't always want to use lipstick on sunny days, so I tend to use this. I think I received this in a magazine a while ago. It had smooth non sticky formula. 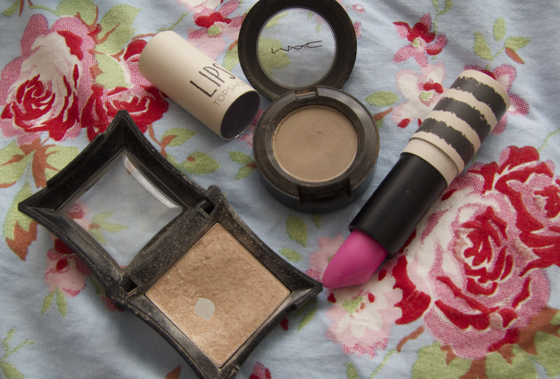 Great favourites, I love the Topshop lipstick - so bright and perfect for the summer! First off, i just wanted to compliment you on how beautiful your blog is! 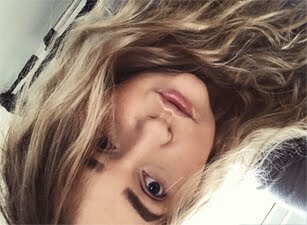 I love your photos, its probably really silly but i actually get really annoyed when blogger put up out of focus and poor quality photos up. Its probably just me being picky! I have become really obsessed with reading favorite posts. I love being able to know what real people think of a product before i go out and buy it. No one likes a dud! You have such lovely products in your favourites.